Mums need meditation probably more than anyone does. They’d like to think they’ll be able to ignore their needs while taking care of children, work and home. But children are sensitive to a mother’s stress and reportedly have higher stress themselves when the mother is overworked, anxious or depressed. With so little time to spare, mums need a practice that works and doesn’t ask them to clear their busy mind of thoughts or to concentrate. Transcendental Meditation is easy to learn and effortless to practise, and most importantly it’s a powerfully effective stress buster. 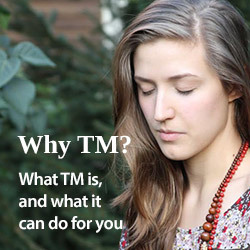 Research has found that TM produces a state of profound relaxation, much deeper than ordinary rest and accompanied by increased alertness and orderly brain function. Regular practice results in decreased anxiety and depression, reduced insomnia and hypertension. Intuition, patience, wisdom, love—all the beautiful qualities associated with motherhood—often depend on how rested we are, how aligned we are with our own inner voice and source of nourishment. By diving deep within, the mind effortlessly settles to quieter levels of thinking, transcending the pressures, worries and agitation of the active mind. Twice-daily experience of inner silence, happiness and energy not only replenishes our depleted reserves but creates vibrant consciousness and a naturally relaxed, stress-resilient physiology. Many mothers find that fitting meditation into their day more than makes up for the time it takes. Whether it’s during your baby’s nap, after your kids go to school, or before they come home, taking time to nourish yourself prepares you to be ‘on’ for others. If you work outside the home, meditating first thing in the morning or on your break at work may be best. As a mum, consider bringing meditation to your family. Children can learn TM as early as age 10, and there is also a technique suitable to children under ten.